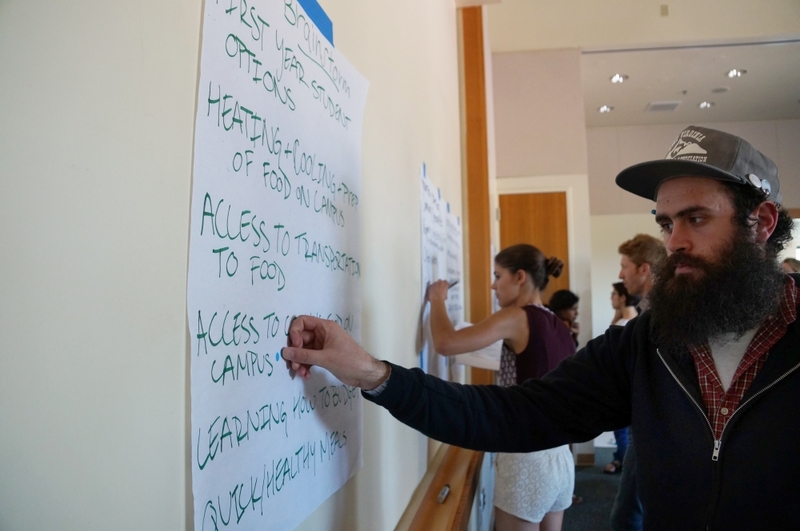 The UCSB Campus Food Justice Forum invited students, staff, faculty and community members to air their concerns about the campus food system and to pose potential solutions. The UCSB Campus Food Justice Forum is the second in an ongoing series of public discussions meant to generate ideas and energize the community around food security. 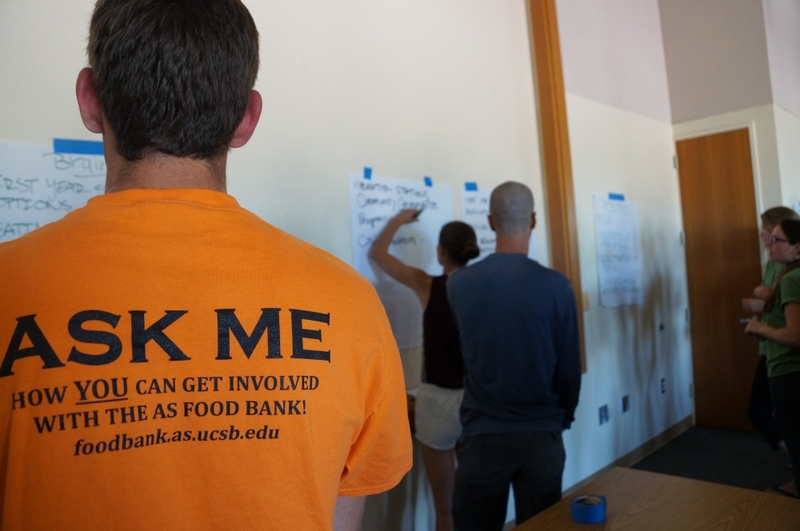 With an eye toward generating goals for the future — and energizing the community to get involved now — UC Santa Barbara on Wednesday hosted a food-focused public brainstorming session. The Campus Food Justice Forum was the second in an ongoing series of periodic open conversations meant to collect the experiences, concerns and ideas of students, staff, faculty members and area residents about the UCSB food system and turn them into action items for both the near and far term. The series is timed to ensure that the campus community can influence the next revision of the UCSB Campus Sustainability Plan, which is slated for this year, and the implementation of the still evolving UC Global Food Initiative that launched last July. A joint effort of UCSB Sustainability and the Associated Students Food Bank, the forum is reflective of the university’s continued push to address food security on campus, in the community, across the state and around the world. Among other things, its results will inform the efforts of a new committee on campus, the Food Security Work Group, which is devoted to addressing food insecurity among UCSB students. “Simply put, we want to see everyone in the Gaucho family gain better access to fresh, nutritious food,” said Katie Freeze, a fourth-year environmental studies major and chair of the Associated Students Food Bank Committee. The AS Food Bank has serviced more than 2,500 students since summer 2014 alone. A call-out style brainstorming session involving the entire crowd of some 50 people raised food issues of everything from pricing and budgetary constraints, to a dearth of nutrition knowledge, to the limited options for healthful dining on campus. Among the other top interests that emerged from the Campus Food Justice Forum: expanding UCSB’s use of the Isla Vista Food Co-op as a resource for food education and services; instructing students on nutrition, budgeting and meal planning; and fostering the options and opportunities for growing food on campus — and providing that food to students who need it. An inaugural session held in March, the Isla Vista Food Forum, gleaned priorities including the creation of a community food center, the growth of additional community gardens and increasing affordable food options. The forum series as a whole is part of UCSB’s efforts in the broader UC Global Food Initiative (UCGFI), which is designed to coordinate the diverse resources of the University of California to help ensure adequate nutrition — starting with access to food — for all. Unveiled by UC President Janet Napolitano in July 2014, the UCGFI will harness the system’s collective excellence in research, outreach and operations in a sustained effort to develop, demonstrate and export solutions — throughout California, the U.S. and the world — for food security, health and sustainability. For its part in the larger initiative, UCSB is a key player on systemwide committees looking at issues including sustainable farming practices, better enabling small growers to become suppliers, fisheries research, student food banks and more.